Now that movie is in your head, isn’t it? 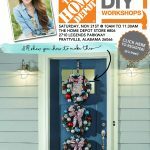 Before we jump into the tutorial, be sure to mark your calendar for Saturday, 11/19 and sign up for The Home Depot DIY Workshop. 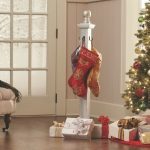 These workshops are free to attend and you’ll learn how to make your own festive Christmas stocking holder. 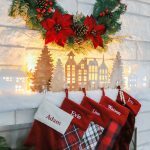 Check out how my blogging buddies customized their DIY Holiday Stocking Holder. So much creativity right here. Click the links below to take a peek. If you want to make my North Pole version, then read on, friends. First, measure and cut the 4×4 to length. Mine is 41 inches long. 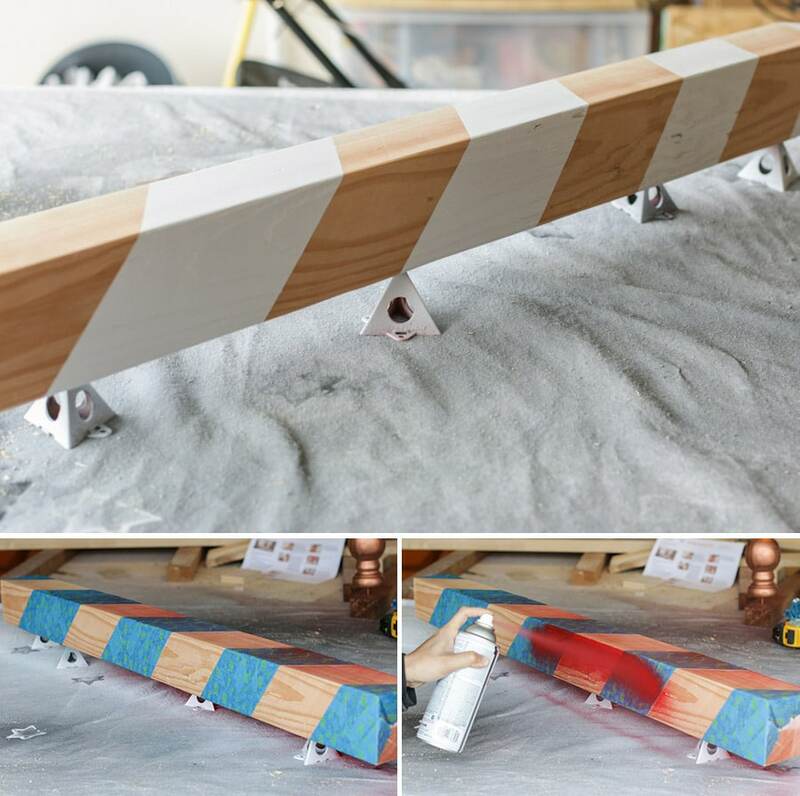 Next, use painter’s tape to mask off diagonal stripes on the post, then spray-paint it white. After the white paint dries, mask off the white parts so you can spray-paint the remaining stripes red. These painters pyramids are super handy to have around. I spray-painted the post cap, post skirt, and ball top finial metallic gold before assembling the pieces. Apply wood glue to the top of the post, secure the post cap onto the post and allow the glue to dry. Next, pre-drill a hole in the center of the post cap and screw the ball top finial in. 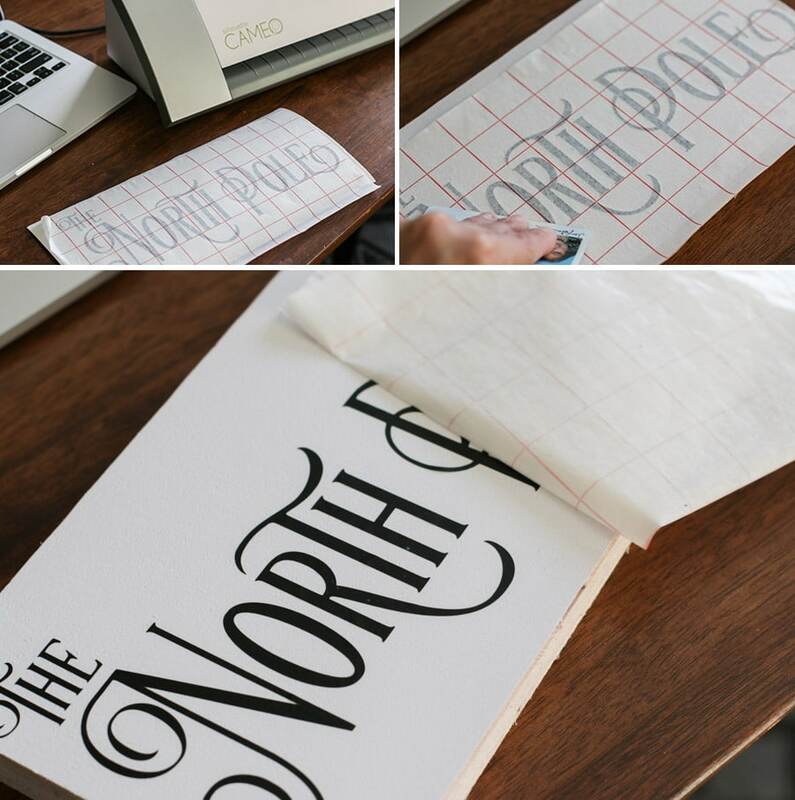 Now it’s time to make the North Pole sign. 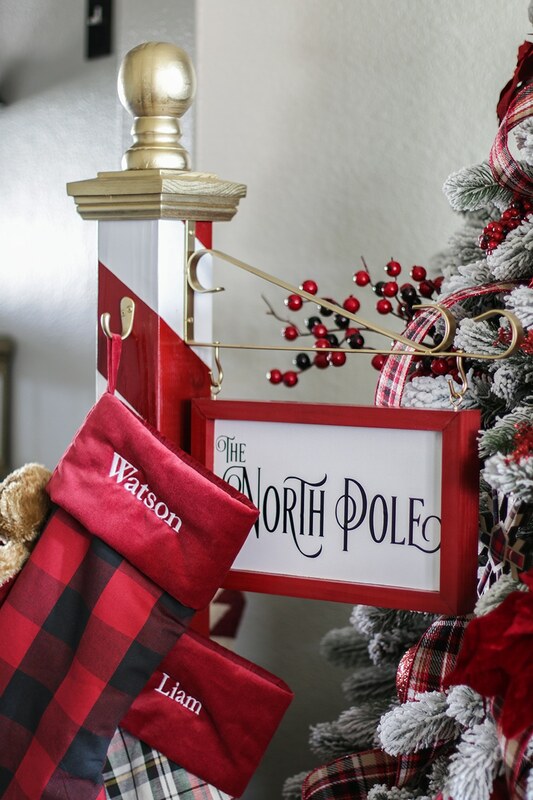 While browsing Pinterest for inspiration, I stumbled across this adorable vintage-looking North Pole sign. 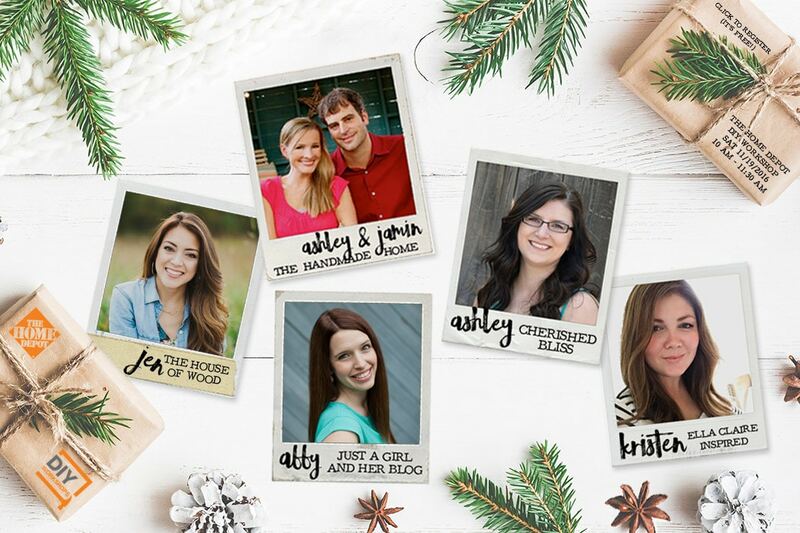 It was designed by my friend and fellow blogger, Virginia of Fynes Design – and good news: you can download her design file for free! I simplified her design for my project and used a font called Artisan. I cut the lettering out from black adhesive vinyl with my Silhouette Cameo (electronic cutting machine) and used transfer paper to transfer the text onto a scrap piece of plywood. 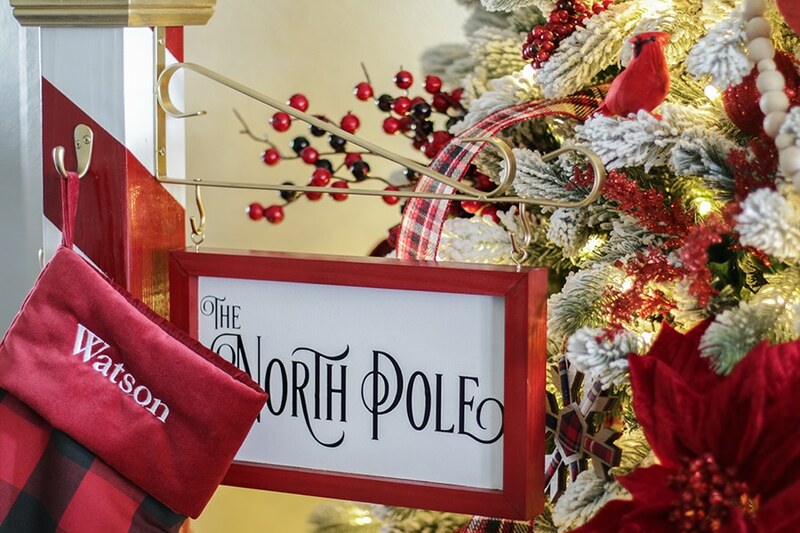 I racked my brain trying to figure out how to hang my North Pole sign from the post. I considered building a bracket out of wood, but I had my heart set on a metal wrought iron thingy (technical term). Do you know how difficult it is to google something without knowing the proper term to use? Very. I even googled “how to weld things” but ultimately decided that a crash course in metalworks was not in the (Christmas) cards at this point in time. Then I found this hanging plant bracket in the Home Depot garden center and suddenly I heard angels singing the Hallelujah chorus. I almost yelled out, “Son of a Nutcracker!” but quickly remembered there were young children present. It came in black, so I spray-painted it metallic gold to match the project and then screwed it onto the post, all the while congratulating myself for being such a freakin’ genius. One day I will learn how to weld, but that day is not today. I constructed the base out of scrap 2×4, added a post skirt, and attached the base to the post with 2-1/2 inch screws. Next, I cut a simple mitered frame for the sign, spray-painted it red, and attached it to the sign with wood glue. I used eye hooks to hang the sign from the plant bracket. Finally, I screwed on the robe hooks (spray-painted metallic gold), and hung the stockings up. 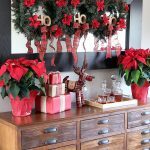 Want to see even more fun and festive customizations of this project? 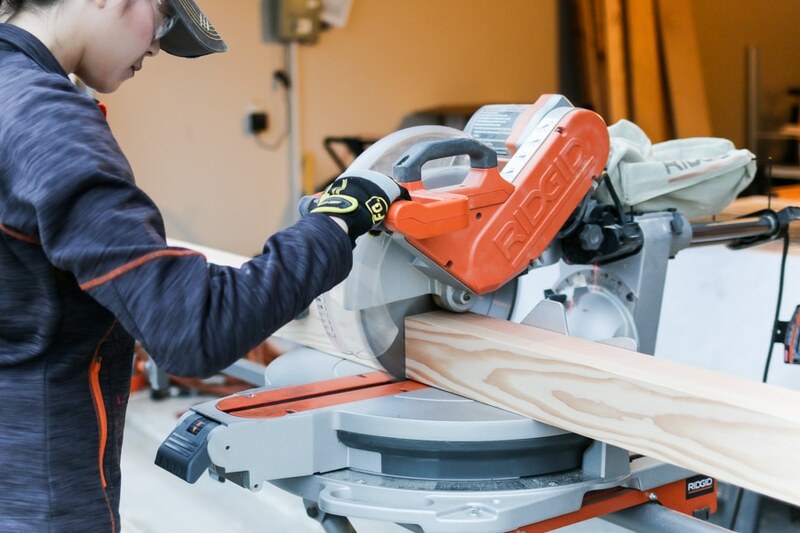 Don’t forget to sign up for the DIY Workshop in your area – check your local Home Depot for details. Are you on Instagram, Twitter, or Facebook? 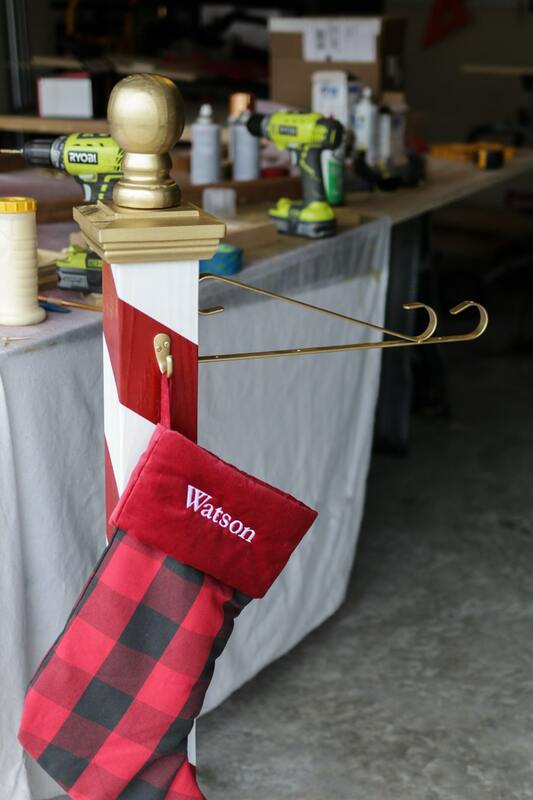 Join in the fun and show us your DIY projects by tagging #jenwoodhouse, #homedepot, and #DIYWorkshop. Jen this looks amazing! Such a cute idea. I love the sign and the metal bracket! 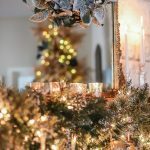 So festive and pretty! Yep, just the way I imagine the North Pole during Christmas. 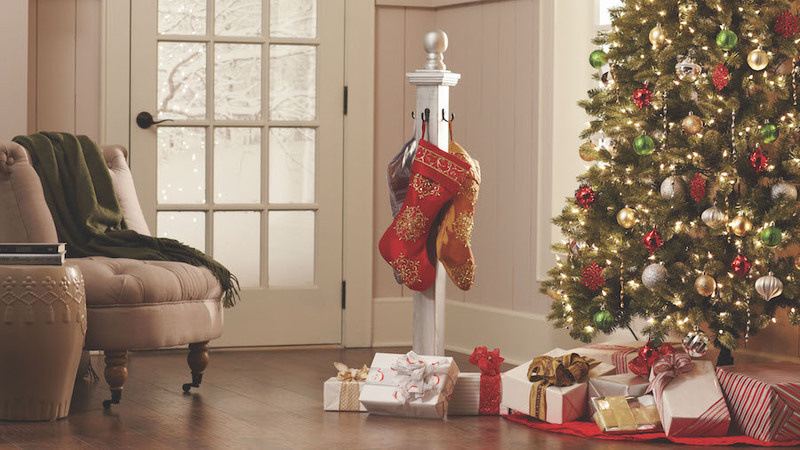 Love the post… And the tree… And the stockings.. I love this and can’t wait to start on mine tomorrow! 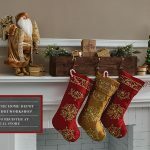 What are the dimensions of your North Pole sign? The plywood sign measures 6″x11″ and the overall dimensions (including the frame) are 7-1/2″x12-1/2″. 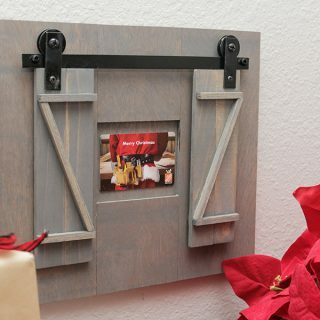 My BFF and I went to the DIY workshop at Home Depot to make this. Got there and no one knew what was supposed to happen. Luckily, we were the only ones signed up and we were able to just get what we needed and went home to make them, but I have to say I was disappointed in THD. Oh, no! I’m so sorry to hear that Mandy! Let me contact THD corporate and see if they can make it right. So sorry again! 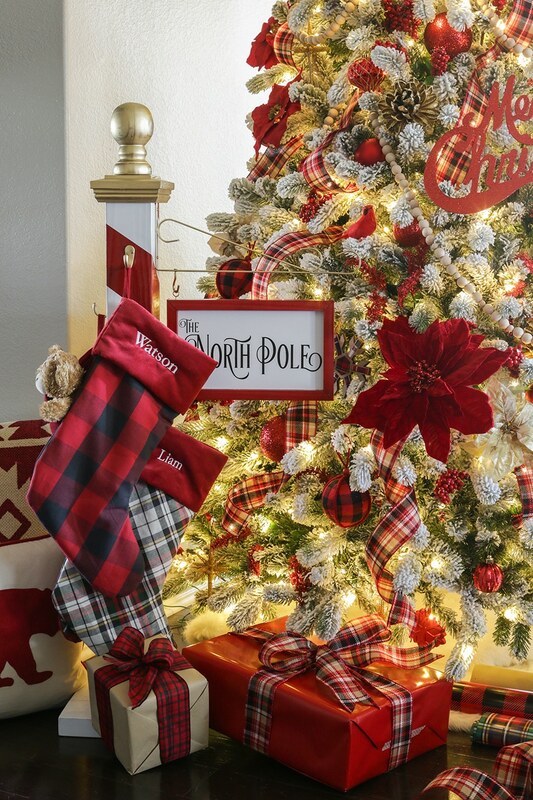 Did you make the frame for the North Pole sign? What is the color name and brand of the red paint? I have looked everywhere on the internet and can no find the Artisan font. Where did you find it. I would appreciate any help you can provide. The font is linked in the post. Hope that helps! What metallic gold spray paint did you use? Love the way yours looks!! Thanks Candace! 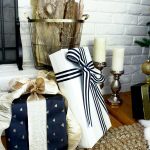 My favorite is Rustoleum’s metallic gold spray paint! I love this! And am in the process of making it. What was the dimension of the vinyl cutout that you made for the sign? I don’t have a cameo or a Cricut so I’m going to have someone make the letters for me. Thank you! 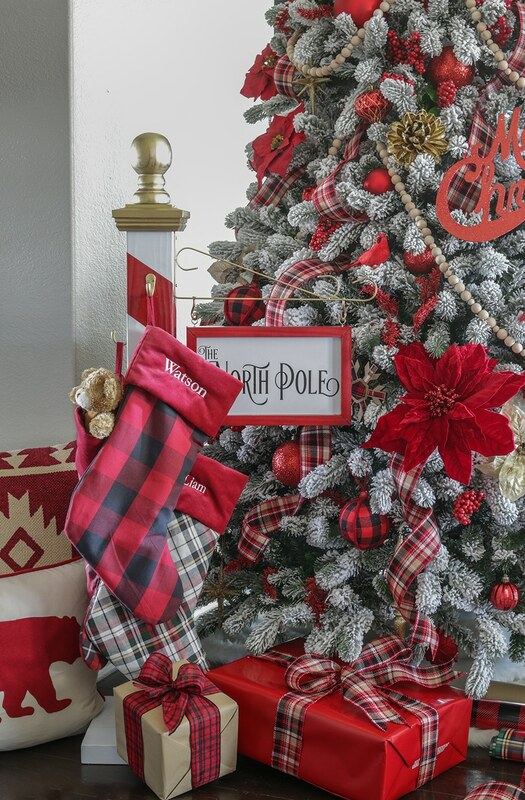 What and where can I find the hooks hanging from the plant hanger to the eye hook?